I’m sad that I won’t able to attend tonight’s public memorial to Wen Hui Ruan, the 68-year old retired garment worker and grandfather who was brutally assaulted by 20 year old Jamie Pugh and was left for dead a couple Fridays ago. Ruan would die the following day from the injuries he sustained from the unprovoked attack. As I previously wrote, the attack hit really close to home in many ways – not just from a human standpoint, but location, race, and timing all contributed to my re-thinking of my perception of not just the streets and avenues that surround me, but New York in general. 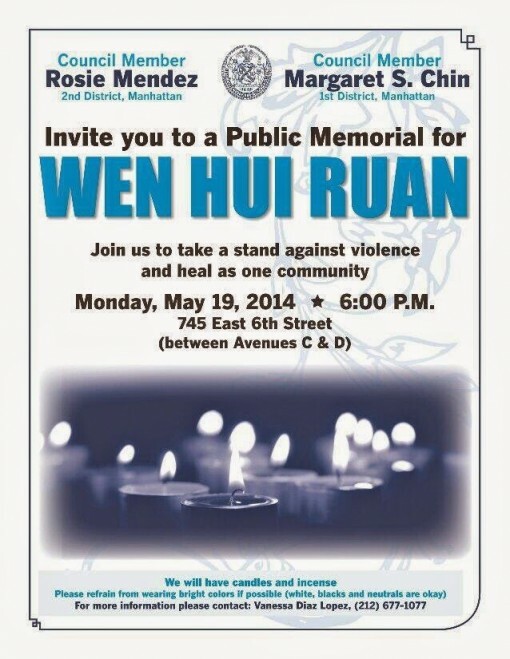 The memorial will start at 6 PM tonight at the location of the assault- 745 East 6th Street between Avenues C and D in Alphabet City. To catch up on the story, EV Grieve has a detailed recap of the attack.